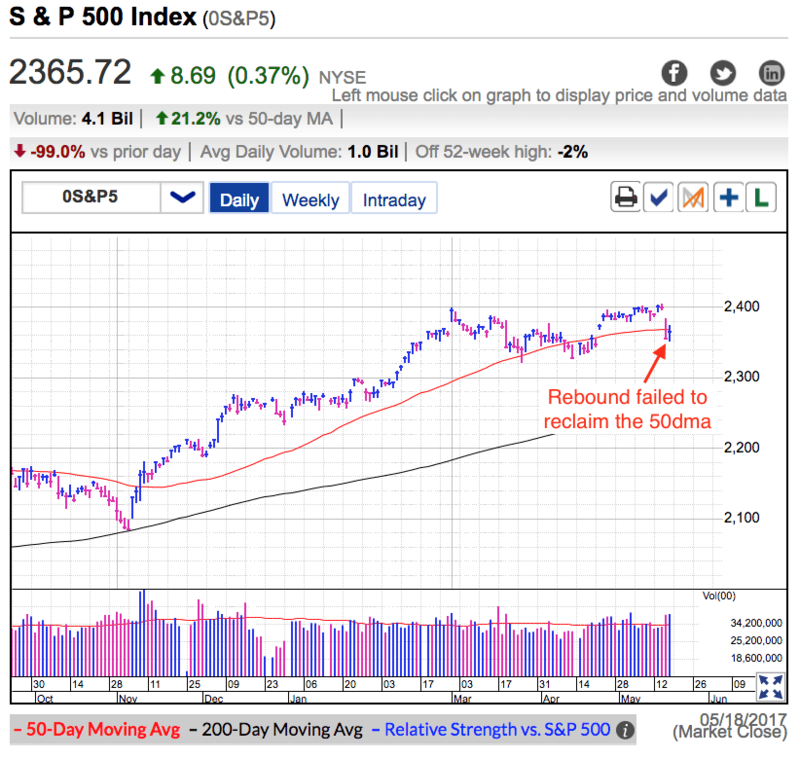 On Thursday the S&P500 recovered a portion of Wednesday’s big crash. It was comforting to see the selling take a break as the supply of nervous sellers dried up. One day is certainly not enough to call this a bottom, but this is definitely a step in the right direction. The turmoil started Tuesday night when a memo surfaced alleging Trump pressured the FBI director to drop the investigation of a former member of his administration. This ultimately resulted in the appointment of a special counsel to investigate the Trump White House. At best this is a huge distraction that will affect Trump’s ability to govern. At worst it could lead to his impeachment. To this point the market has largely ignored the Trump circus, but this SNAFU poses the largest threat to the Republican’s tax cut and regulatory reform agenda. Since this is the foundation of the post-election rally, anything that threatens it also puts recent gains in jeopardy. So far Trump has not been accused of doing anything illegal. This leaves the odds of impeachment low, especially in a Republican controlled congress. But Trump’s political capital is quickly evaporating. Lucky for him the Republicans in Congress share many of his same goals. While Trump might not get his Wall and the tax cuts might not look like what he proposed, Congress will still put bills on his desk and he will sign them. This continues to be the most likely outcome and after this brief bout of anxiety, the market will come to this realization too. That is why today’s selling took a break. Most likely this is nothing but a blip on our way higher. That said, we might not have seen the bottom of this dip just yet. These things usually last more than one day and it is definitely premature to call the pullback over. If we were truly oversold, we would have seen a more decisive rebound Thursday. Instead we bounced a little bit and then mostly traded sideways through the remainder of the day. That tells us a lot of traders were not read to jump onboard the rebound. Trading-wise we need to see the market hold Wednesday’s lows for a couple more days. If we don’t get a second leg lower by Monday morning, then this selloff is dead and we can start looking for the next trade. But if prices slip Friday morning and undercut Wednesday’s lows, expect that to trigger another wave of reflexive defensive selling. But rather than be the start of something bigger, this will most likely be the last push lower before a capitulation bottom. This would be a better place to be buying stocks than selling. Remember, risk is a function of height. This is the lowest prices have been in months making this is the safest time to buy in a while. Remember, we make money buying discounts, not paying premiums.